Note: This post may be sponsored or contain affiliate links. My Keto Breakfast Pockets will become your favorite grab-and-go breakfast! They are freezable so you can just pop one in the microwave before running out the door. 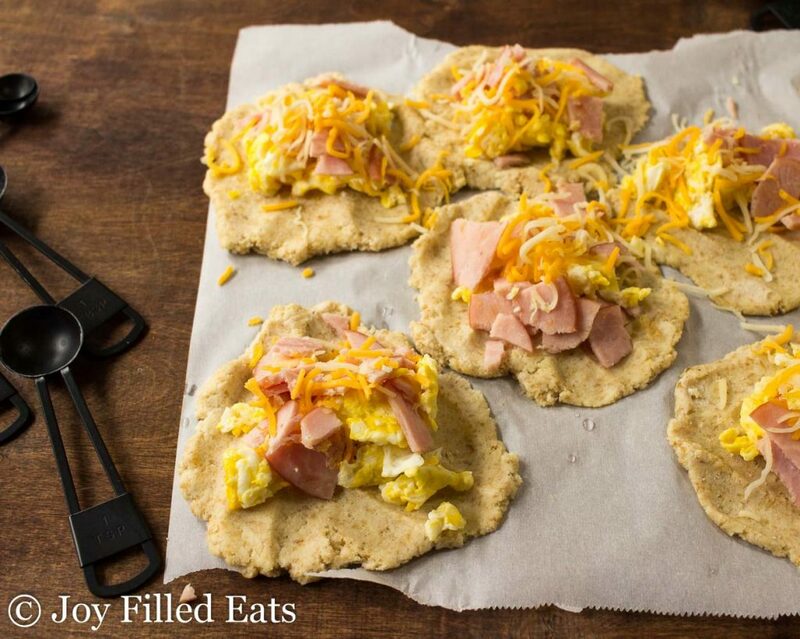 You can easily customize them with your favorite breakfast meats and cheeses. I have a really hard time with breakfast. I have a bad habit of only drinking coffee until lunch if I don’t have something easy to grab. 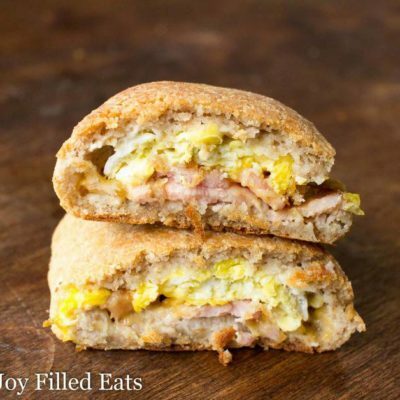 Pair that with my childhood nostalgia of eating hot pockets and I knew I wanted to make a freezable breakfast pocket that could just pop in the microwave. 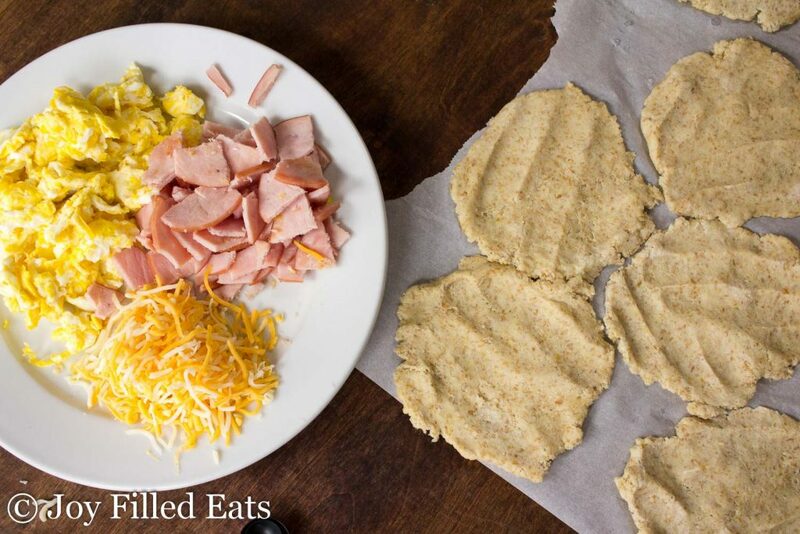 These Keto Breakfast Pockets fit the bill. The genius low carb mozzarella based dough is the key. My tricks, after making this dough dozens of time, are to get the cheese good and gooey and then mix it in the food processor. 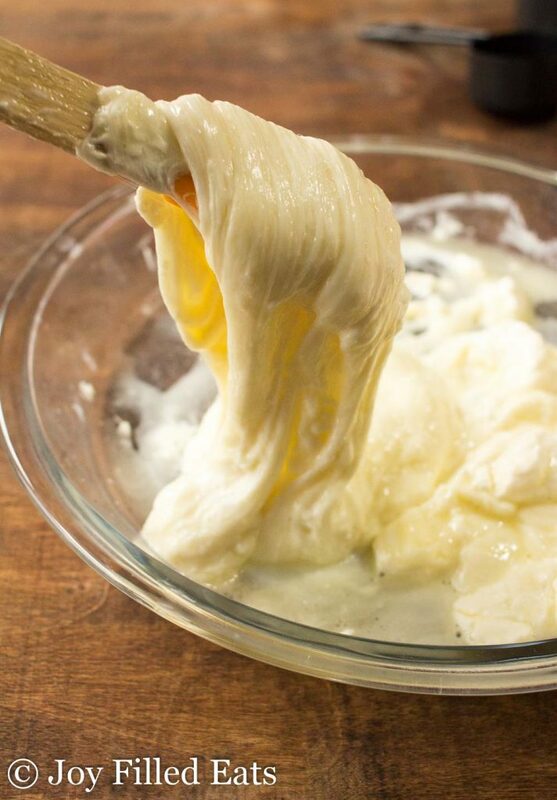 This helps to make a perfect uniform dough without threads of mozzarella. After you make the dough so just need to scramble a couple of eggs and then fill the pockets and bake. If you’ve made a fathead pizza before you can make this recipe. I used chopped Canadian bacon but you can use any cooked breakfast meat. Bacon, sausage, ham, or my personal Jersey girl favorite, Taylor Ham. Pork roll to any of you in the southern half of my home state. These would also be great with some sauteed or steamed vegetables. Mushrooms, peppers, and onions. Broccoli and cheddar. Spinach, tomatoes, and mozzarella. The possibilities are endless. Isn’t that golden dough pretty? I love a good pastry. Savory or sweet, it doesn’t matter. My Spinach & Feta Pastries are also a must make. They are my take on the classic Greek Spanakopita. 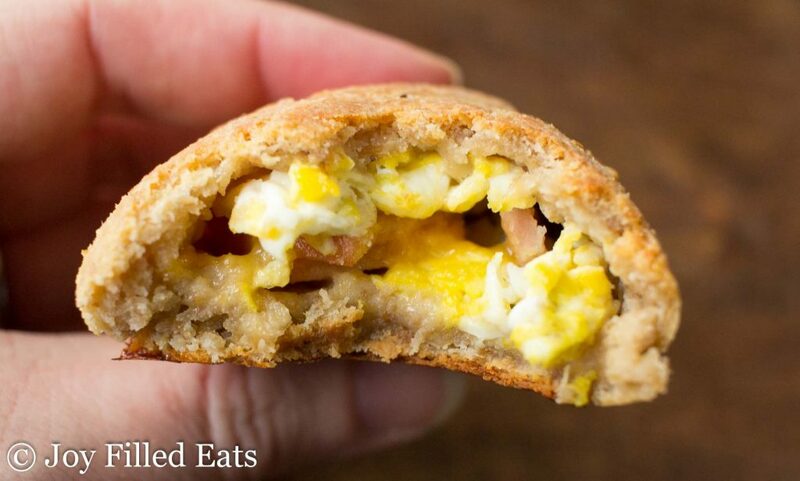 Give my Keto Breakfast Pockets a try for your busy mornings! Like what you see? Follow me on Facebook! Love this recipe? Leave a comment & 5-star rating right here! Make sure you don’t miss new recipes by getting email updates! Put mozzarella cheese and the cream cheese in a microwave-safe bowl. Microwave one minute. Stir. Microwave 30 seconds. Stir. At this point, all the cheese should be melted. Microwave 30 more seconds (it should look like cheese fondue at this point). 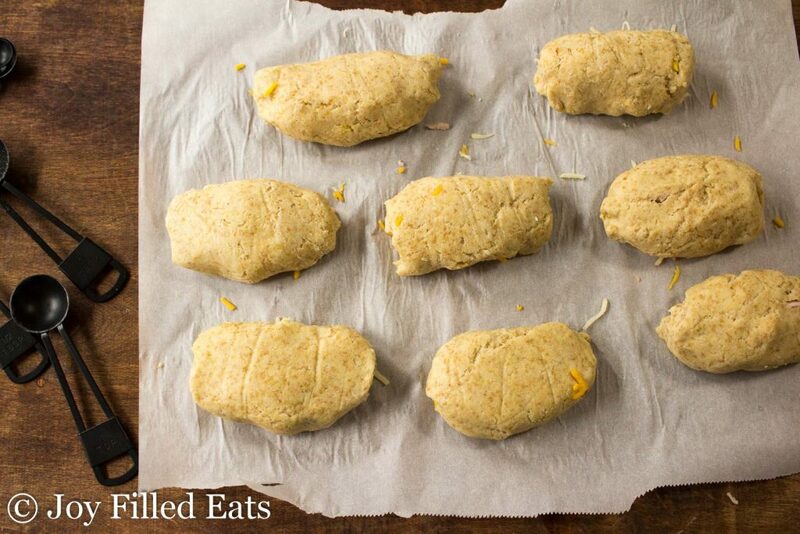 Put the melted cheese and the other dough ingredients into a food processor and pulse until a uniform dough forms. (Alternatively, you can mix by hand but make sure to knead the dough thoroughly). Divide the dough into 8 pieces. 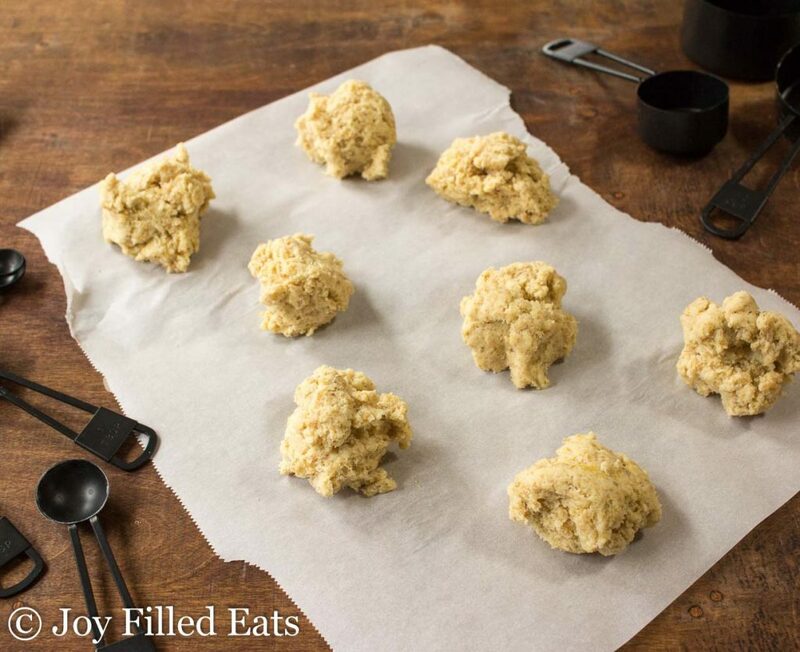 Press each into a 6-inch circle on a piece of parchment paper on a baking sheet. It helps to wet your hands. Divide the filling between each circle of dough. Fold in the edges and crimp to seal. Place back on the parchment seam side down. Bake for 20-25 minutes until golden brown. These are freezable. Just cool completely, place in a plastic baggie, and freeze. Reheat in the microwave for about 1 1/2 minutes. Microwave times will vary. They shouldn't be dry. You might have over baked them. You can always add extra cheese. I love this recipe! Thanks for sharing, my 1st batch came out awesome, my 2nd batch, like others have described came out a bit dry and started breaking apart. So I added about a tablespoon of hot water at a time till I got the texture that I wanted and it didnt fall apart after I added a bit more water. This dough texture reminds me a lot of corn dough that is used to make tamales. So if you've made tamales this might be easy for you to make. I also took another user's advise and used a corn tortilla press, that made spreading it an easy. Definitely a redo. Already made 2 batches one with chorizo and egg the other with pepperoni, marinara and cheese and the kids love them! I have made this recipe twice in less than a week. The first batch I stuffed them with egg and spinach and the second batch I stuffed with pepperoni and mozzarella. The possibilities are endless. The second batch was a little crumbly, so I added warm water until they formed and held properly. I shaped them into small empanadas. Thank you for these, they are delicious! Amazing to read these recipes and I love them so much. My family wants to try this. The ingredients I use in mug eggs would be good for this. Eggs , Mediterranean feta, sun dried tomatoes and diced ham. Do you defrost before heating in the micro? No, I just pop them right into the microwave frozen. I saw a comment where you stated the nutrition information was for one pocket. The filling you call for all 8 pockets is less than my daily breakfast, lol. I'm a two meals, <20g carbs/day guy. Is there a way to scale this up for one large 750-800 calorie meal while keeping the carbs down without just covering it in butter? 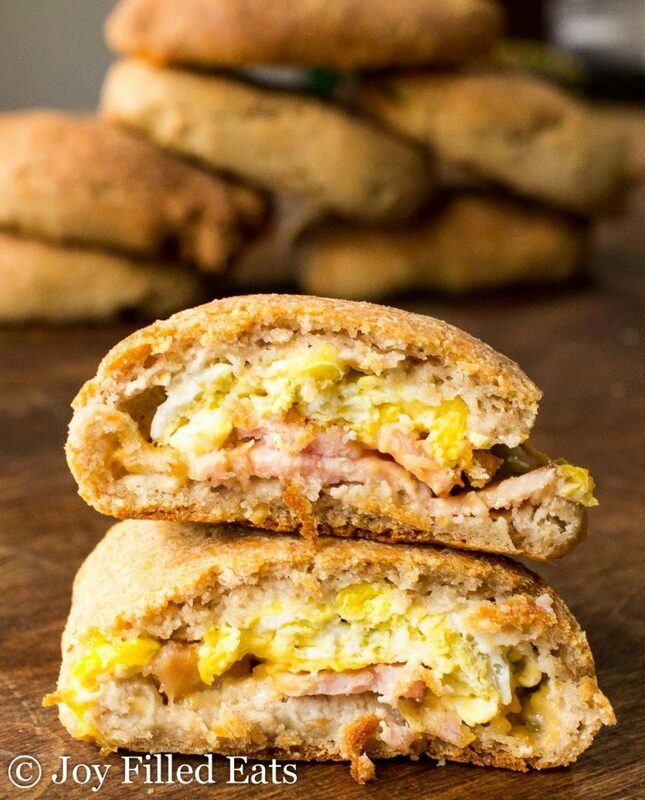 You could make a couple large stromboli type breakfast pockets so you can add more filling with less dough per serving. The dough is what has the carbs. Or you can enjoy a hearty portion of bacon on the side. Help! Mine came out sooooo dry and crumbly. I am a novice baker, never mind Keto baking! :) Any idea what I've done wrong? Followed the recipe to a tee. Thanks! Are you sure you used the right amount of coconut flour? Messing up that one ingredient can make a big difference. Was the cheese completely melted and hot? Did you mix in a food processor or by hand? Mine also crumbled... I did the recipe about 5 mins ago.. Just in the oven now. How you got that nuchal filling looking so gorgeous i don't know. I cooked another couple of eggs since the teen will totally fill up on most of these. Oh, I substituted almond flour with chickpea flour. Sher - I have not tested this recipe with chickpea flour. That is probably why your dough crumbled. I don't recommend switching out flours. If you have a nut allergy sunflower seed flour is closer to almond flour in consistency. Hi, If I don't have almond flour, with what should I substitute it ? I recommend using a tortilla press to flatten your dough. It stretched the dough evenly and in a nice circle. Wet your hands often to keep the dough from becoming too sticky and watch your baking times because they burn easily! I will be experimenting with different fillings. THANK YOU for this recipe! Ooo that is one of the few kitchen gadgets I don't have yet. I need to add it to my list. Thanks for the suggestion! Your name is Taryn?!? So is mine! Yup 😀 nice to meet you! I love meeting other Taryns. Did you use fresh mozzarella, or pre-shredded mozzarella? 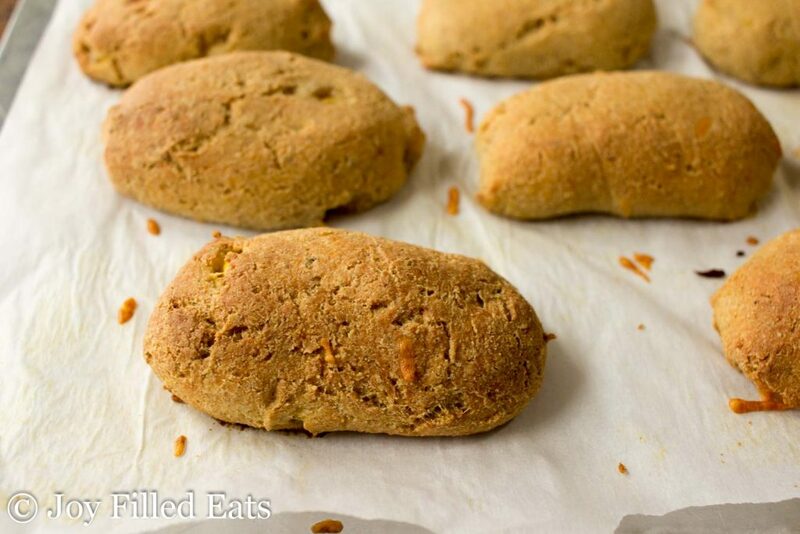 Can the coconut flour be substituted for anything else like flaxseed meal? Yes, you can flax instead of the coconut flour. I prefer using the ground golden flax. Hmmm... you could decrease the amount of filling a bit. Sometimes I sprinkle some of the cheese on the outside of the pastry. Adding a little gelatin or xanthan gum to the dough might help it stretch but I haven't tested that yet. Hi! Every time I try to reheat a frozen breakfast pocket, the eggs are green and overcooked and yucky. Does this happen to anyone else?? I totally agree! Over cooked green funky eggs!!! They were after all cooked 3x at this point, right? 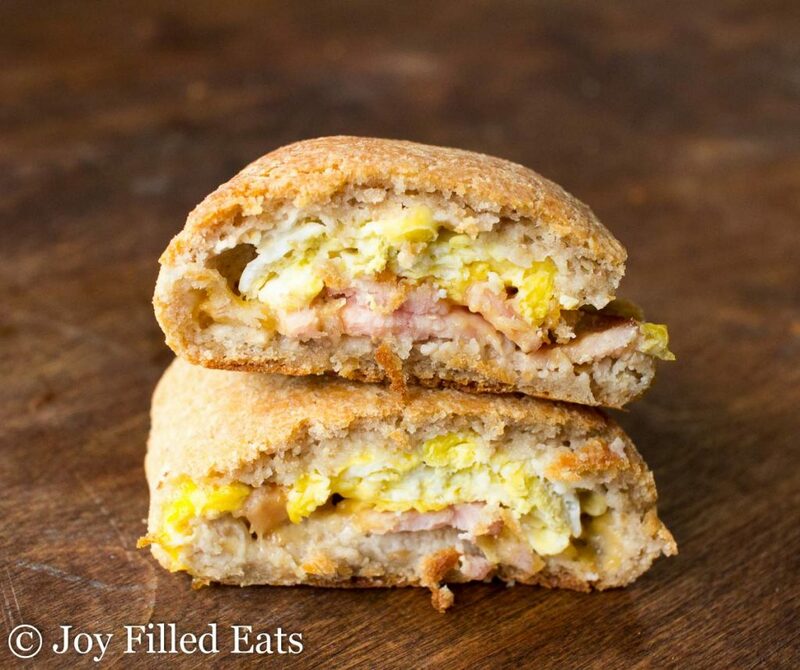 You can just make these with ham and cheese to avoid the 'funky' eggs. We didn't mind. Does it have to be mozzarella or can you use a different cheese? I have used a semi-soft cheddar in this type dough before. You want a semi-soft cheese. Could i sub THM baking blend? I think Baking Blend would work but I haven't tried it. Use a little bit less. It is drier than almond flour. These are delicious. So many options. My whole family, except for the kids, and they are on gluten free,,is on a low carb, keto friendly diet.. I am so excited to try these recipes. Thanks for your hard work. I'm Taryn. The kitchen has always been a joy filled place in my life. Even in the midst of dieting and weight loss food should bring JOY. I have lost over 50 pounds and enjoyed every bite. Join my bi-weekly newsletter to receive new recipes in your inbox! All recipes, headnotes, photos, and stories on this site are the original creations and property of Joy Filled Eats. You are welcome to share a photo and link to the recipe from this site, however, re-publishing the recipe in its entirety is strictly forbidden. Simple substitutions do not make it an original recipe, so please refrain from adapting the recipes without properly linking back to the original recipe. 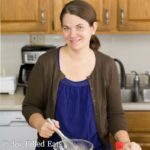 Get the Cookbooks by Taryn of Joy filled Eats! Handcrafted with by Taryn. © 2019 Get in Touch.